I have enough kids that we have to be cost-conscious when we go places. A $10 admission sounds reasonable…but I have to multiply that by 5 and remember that as soon as we get inside, someone’s going to throw up on my shoes. 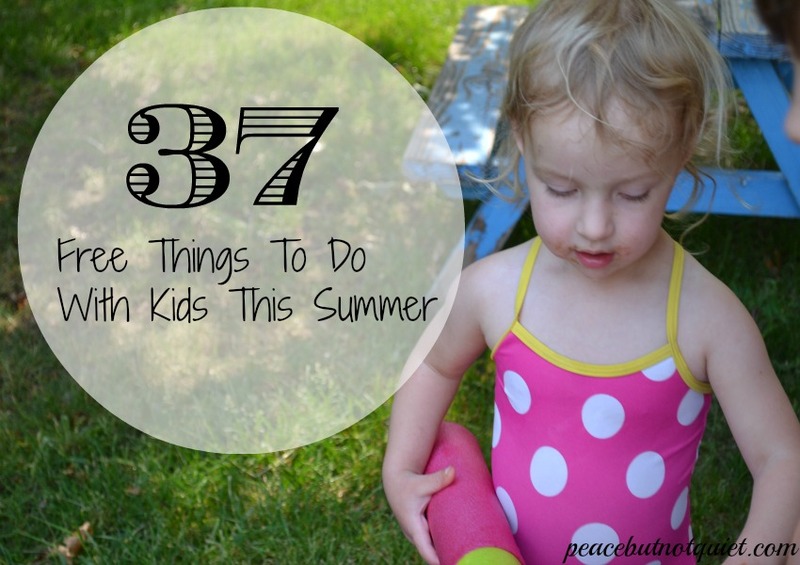 So I’ve compiled a list of 37 free summer activities for kids — you can print this list and pull it out the next time everyone’s looking for something to do. 1.) Play water games. One of our favorites is simple — have one kid stand at the end of the yard with a pasta strainer on his head. Have everyone else try to toss water balloons into the strainer. Even if the balloons land on target, often they break and douse the kid underneath. You can find more water balloon games at Fantastic Fun and Learning here. 2.) Visit a berry farm. This can cost, if you decide to pick and/or buy some berries. But you can also just visit and look around. And if you do buy berries — well, you were probably going to buy them at the store anyway. You just did it here and had a little more fun. You can try this website to find a Pick-Your-Own farm near you. 4.) Go to an outdoor concert. Many parks and cities offer free concerts in the park all summer long. Check with local parks for a schedule, pack up some picnic food or snacks, and go boogie! 5.) Go to the beach. Whatever “beach” means in your neck of the woods. For us, it used to mean real beaches at the Pacific Ocean in California. Now that we’re landlocked, it means lake beaches, or sandbars in a river. As long as there’s a little sand and a place to dip our toes in — it’s all good. 6.) Have a water fight. You can do it with household utensils, buckets and soda or water bottles. Or you can buy yourself some water guns. Or you can google how to make your own water guns — there are so many ideas out there, I didn’t even know where to start. My husband made a super-soaker for us out of PVC pipe that requires adult supervision or it’ll take someone’s eye out. So many possibilities. 7.) Try one of these 25 Ways to Play Outside With Your Kids. Do you have more ideas for fun, free things to do with kids? Share them in the comments! This is a great list! It will come in very handy this summer! What gr8 ideas – thx v much for taking part in the parenting in it party. I will have a few ideas now for the summer. Particular looking forward to my water fight!